Ex sommelier Eric Bordelet has created a superior 'grand cru' cidre, that offers 20 different cider apple varieties in the one blend (40% sweet, 40% bitter and 20% acidic). It's lighty filtered, naturally sparkling, oak aged and packs tonnes of apple tannin, bitterness and flavour. Off dry and biodynamically made, it's bound to make any real cidre connoisseur very happy indeed. Perfect with roasted pork or cheese, its a handy addition to any dinner party. Saludos desde Espana!! (Greetings from Spain!!). So I thought it would be time to head over to the land of Rafa Nadal and Fernando Alonso and try some of Spain’s finer sidra (cider) offerings. I must note, although I’m not over in Spain in physical stature, I’m there in spirit – and that’s the main thing! Sigh! Spain is a known sidra producing country in Europe, with Asturias (in the North), and Basque (in the North East) considered the major producing regions. 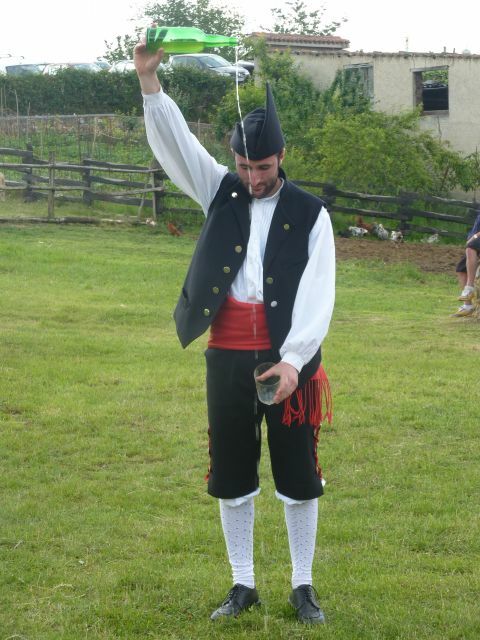 Asturias is made famous by the vertical pour or escanciar un culín, where a person holds the bottle above their head and pours the liquid into a glass held below their waste. The theory here is oxygen makes contact with the highly volatile sidra and aerates it, giving a sparkling mouth feel. Although this is a highly traditional Asturian procedure - seen pictured, I just see it as an attempt to make the poorly made sidra drinkable. 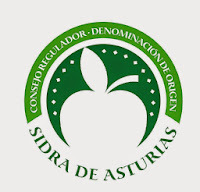 Sidra Escanciador is a sidra producing company from Villaviciosa, Asturias. The company has been making and crafting sidra since 1914, and has only increased in production and popularity ever since. In 1963, Sidra Escanciador also became the first Spanish producer to put their sparkling sidra into 330mL bottles! Today the company not only exports to Europe, but North and South America, Australia, Japan and parts of Africa. Not a bad effort really. Another cool little fact is their company logo is actually a little Spanish man carrying out the escanciar un culín technique. The sidra in question is none the less, very poor. To begin, it’s filtered to a clear finish and is deep golden straw in colour. When the cork is popped, the artificial carbonation levels are evidently high as it froths up in the glass. Spilling sidra all over my timber laminate floor via a failed vertical pour was not what I had in mind, so I unfortunately didn’t give it a go. Next time maybe on the lawn! As you swirl the sidra around in the glass, the foam rages into an angry beast and immediately you get hints of volatile acidity. *Exit positives, insert negatives now. The nose was without doubt a weird, weird experience. Firstly it was slightly corked – cork taint, also know as TCA (2,4,6 - Trichloroanisole) is a common fault in wines stored under cork. It gives off a musty, hessian bag character – which was evident here. This taint was also in competition with the volatile ethyl acetate, or nail polish remover (another wine taint), and they definitely didn’t complement each other. However, there was some stewed apple notes which I did pick up on combined with some old oak cask funk. I hate to say it, but the nose was very poor and to an average Australian consumer this would not appeal. Palate wise it doesn’t get any better, with a sickly over ripe apple character making it hard to drink. The sweetness was very high but does give the mouth feel a sense of weight. There is some acidity lurking around which does help to cut through the sugar. But from my experiences, the sugar tasted like cheap concentrate, and the acid profile like a malic/tartaric acid combination. There was also no evidence of tannins or astringency, and along with the deep golden colour lead me to believe this sidra had been handled very oxidatively in oak. Even at 4% alcohol, the heat on the back palate was very noticeable and so was the enormous amount of steely sulphur dioxide which was not pleasant at all. So overall, the palate was very simple but largely out of balance in the key elements of sweetness, acidity, astringency, alcohol and sulphur. This is ‘headache in the morning’ material and I would advise to stay clear of this sidra. This style is not suited to Australian cider drinker palates, and really is only for the keen cider enthusiast. I have to admit I struggled to get through a couple glasses to even review it. So do yourself a favour and maybe give this bad boy a miss, you’ll thank me for it! This cider is another classic case of a product utilising a region’s renowned produce. 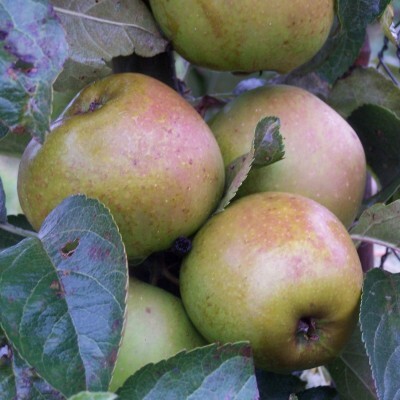 Batlow lies in the cooler climates of the Snowy Mountains, New South Wales (around 450Kms from Sydney), where conditions are perfect for growing superior apples. There is a real history behind the growing of apples in Batlow, and it’s no surprise that we see a cider coming out of this region. It’s reminiscent of the quality ciders coming out of the Adelaide Hills - South Australia’s premier apple growing region. Why not exploit a regions produce to help showcase its qualities and share them with the world? That’s my theory anyway! The cider’s presentation really stands out for me, with its longer necked bottle shape and striking green label. It just stands out in a bottle shop and screams “pick me, pick me! !” The reference of ‘3½ crushed Batlow apples in every bottle’ is such a clever idea as it gives you a sense of intimacy with the product. But at the end of the day, you get that feeling of pride and respect not only for the apples used, but Batlow itself in this cider. I really admire that. On opening, I was surprised by the higher level of carbonation. It was good to see bubbles raging in the glass for once, I must admit. 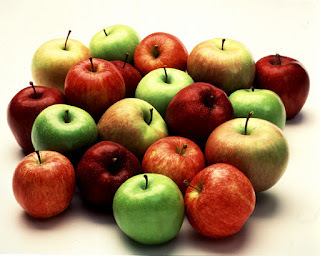 The colour resembled pale straw with the cider being filtered completely clear, both typical of a dessert apple cider. On inspection of the nose, upfront green apples intertwined with citrus, pineapple notes welcome you. Basically the nose is clean, fault free and fresh, just what you want in a cider like this. It does, however, lack the pretty floral characters which are seen in ciders from the Adelaide Hills. But in saying that, the acid profile seemed much more focused compared to its SA counterparts. What I can conclude here is that there is some level of regional variance in apples and the subsequent cider – just like grapes and wine. The palate straight up is dry, but not tart like the Huon Cider from Tasmania recently reviewed on the blog. The dryness is quite thirst quenching, but more importantly balanced with lean acidity. The acidity offers up fresh, zippy attributes that are enhanced by the foaming bubbles which explode in your mouth. I was a little worried that being dry and at 5.2% alcohol, that it may be unbalanced and alcohol ‘hot’, but everything was balanced. There are some residual hints of sulphur, but it was not overly offensive. Once again there is some bitterness on the back palate which I am seeing continually in Australian ciders. 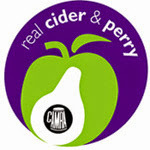 Overall, the cider is a fresh, clean stock standard cider. To someone like myself who loves complexity and texture, the cider is a little one dimensional and plain. In saying that however, it was quite enjoyable to drink and would be perfect on tap at your local. To finish, I love the overall presentation of this cider and love producers who only use the best produce a region has to offer. Nice cider, great work! Right oh, let’s start delving into a little French action shall we? This number hails from the famous cider producing region Normandy, which is in the North West of France. Some of my favourite ciders (cidre’s in French) come from here, with their beautiful apple freshness and focused tannin profiles. A fair whack of ciders that are created in Normandy often come from calvados producing companies – calvados being an apple spirit quite popular in France. This cider is no exception with the company, Calvados Boulard producing this cider out of Coquainvilliers. If you are lucky enough to grab a bottle of this or any Normandy cider, you’ll notice 'Cidre Bouche' splashed on the label (pronounced Booshay). This basically means the cider is bottled under cork in champagne style bottles, usually with smaller corks at 25 x 38mm to release any unwanted carbonation pressures. It’s really cool when you open up a bottle of sparkles or champagne and here that magic “POP! !” sound. That’s exactly what you are greeted with when you twist the cork off this cider. Pouring into the glass it throws off a nice foamy head, and constant bubble almost like a beer. It is filtered brilliant with a golden orange appearance – typical colour of French cidre’s. The nose offers old dusty oak, with orange blossom's and green apples. It really is a rustic, farmhouse nose, which sort of resembles a blue mould character. You get an impression from the nose that it’s going to be a sweet cider on the palate but being a brut, it finishes quite dry. What you see on the palate is bitterness which is balanced with a good tannin structure. Indicating that bittersweet and bittersharp apples were most likely used. The carbonation foams up quite a bit in the mouth which helps add texture and mouth feel. The cider does finish quite short in apple flavour, leaving you again with the bitterness and tannins on the back palate, but overall it's a pretty solid cider. This cider is dry, clean and uber fresh, like the apples were picked just yesterday. If you have never experienced a cider from Normandy then this would be a good place to start. It’s not ostentatious, it’s almost a little shy, but it keeps you interested. It’s a perfect example to help an inexperienced cider drinker to understand the difference between dessert/cooking apple ciders, and real cider apple ciders. Get out there and give it a go, you won’t be disappointed! !